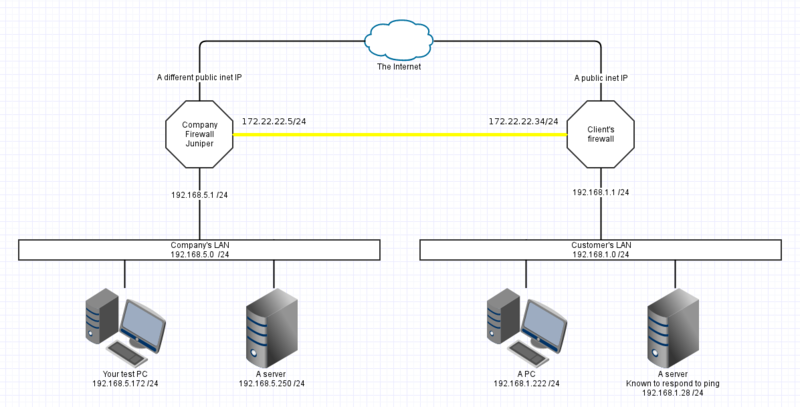 I'll first say that I didn't design this network from the get go, so the topology came as a surprise even to me. There are two subnets (one is our companys and one is our clients) which reside in the same physical location, and because of that the networks are separated by VLAN:s. However, in addition to this both us and our client have different firewalls, so we have an additional virtual router (VyOS) which acts as a bridge between our networks. VyOS router has two interfaces (eth0 and eth1). 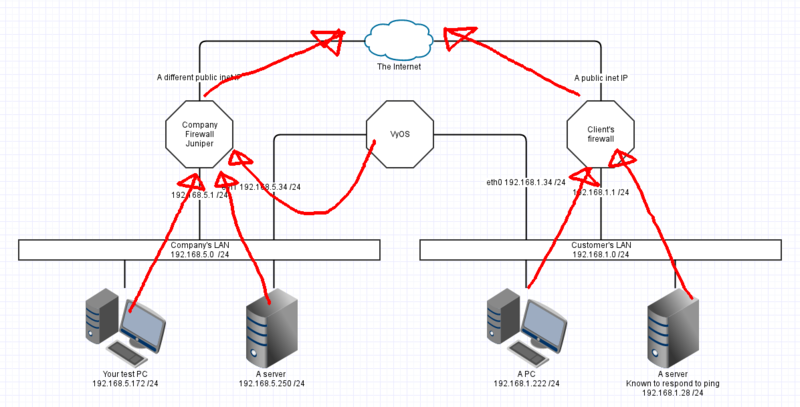 I'm able to ping both networks just fine, but if I try to go to our clients web server at their subnet the connection fails. What is especially interesting is that when I manually set my gateway to point at 192.168.5.34 (VyOS) instead of our gateway at 192.168.5.1 the connection works, so there must be something failing at the firewall when it has to redirect the traffic back out from the same interface where it came from. Also, if I configure source nat it works as well. Each device uses the LAN's firewall IP as its default gateway. 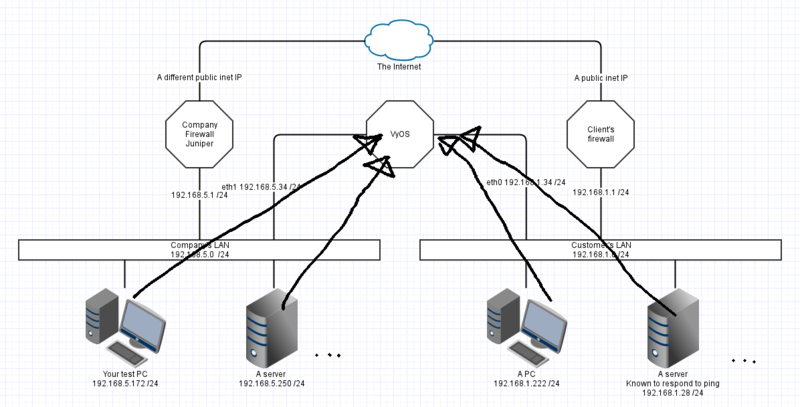 The two LAN topologies were given as being VLANs. 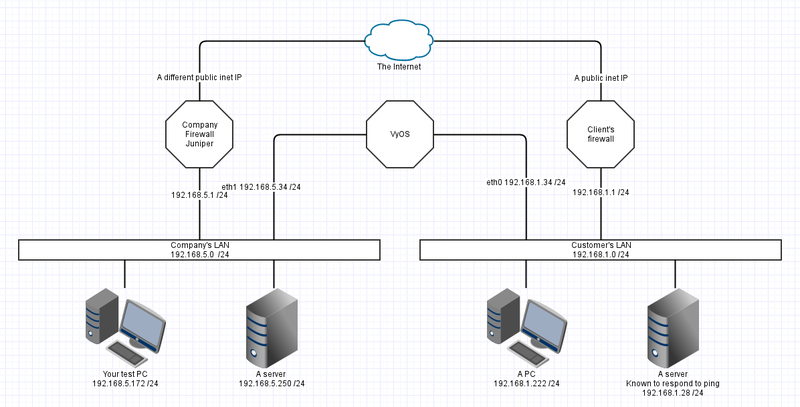 I've left that out for now and we're representing each VLAN as a separate physical LAN. For those following the OSI stack, this is all IP and is at layer 3. Your PC has a packet to send to an IP. First thing it does is checks if Destination IP is in the same local IP network. If both the SRC and DST addresses share the same Network (being the bit of the IP that remains after the subnet mask is applied) then the OS sents the packet out an ethernet interface. The OS labels the outbound packet with the source IP of the interface on which it exits. Your test PC sends packets with a SRC IP of 192.168.5.172 Destination is 192.168.5.250 Your netmask is /24 which is 255.255.255.0, leaving a network of 192.168.5.x Therefore your PC can send directly by putting the packet out the ethernet and the destination will receive it. A default gateway, default route, gateway, router of last resort, is the thing you send packets to when you don't have a better route to send them. So if the destination IP is not local (directly connected) then TestPC knows to address the packet via the default gateway. (side comment) If the VyOS box has a default gateway set, it is probably via your office Juniper. That's nice for updates and stuff, but its not relevant to your environment. Its also totally reasonable for VyOS to not have any default gateway configured at all. Your traceroute from the question indicates that the two office firewalls have specific knowledge of the other LAN. So each firewall will have an additional route configured. Your Company Juniper knows to "access 192.168.1.0/24 via 192.168.5.34"
So lets visualise this from the point of view of a packet. Juniper receives a packet with SRC 192.168.5.172 and DST 8.8.8.8 It is configured to NAT and forward this packet. 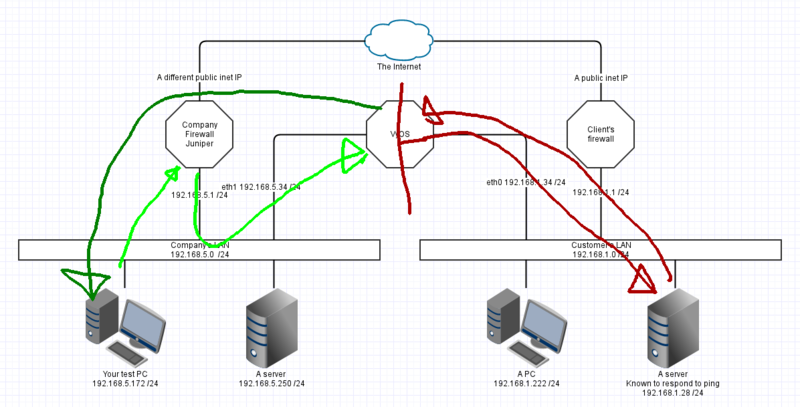 The SRC address is rewritten to the external Inet IP on the Juniper and thrown to the ISP. Juniper keeps track of this connection in a table in memory. As above, testPC does not have a direct connection to 192.168.1.x so it addresses the packet to its default gateway, the Juniper. Juniper is configured to forward packets, but it has a static route to 192.168.1.x via VyOS at 192.168.5.34 So instead of using NAT to change the destination to the ISPs gateway, the Juniper forwards the packet via VyOS. CustyServer sees the packet and receives it. Halfway! CustyServer sends a reply to 192.168.5.172 but that's not directly attached, so we go to the default gateway. The custy firewall has NO IDEA what to do with this packet, so it likely gets dropped, or may be forwarded to their ISP who then drops it. At this point its all over. Reply packet is lost, and TestPC will wait until timeout for the answer. How do we fix this? There are multiple different fixes. 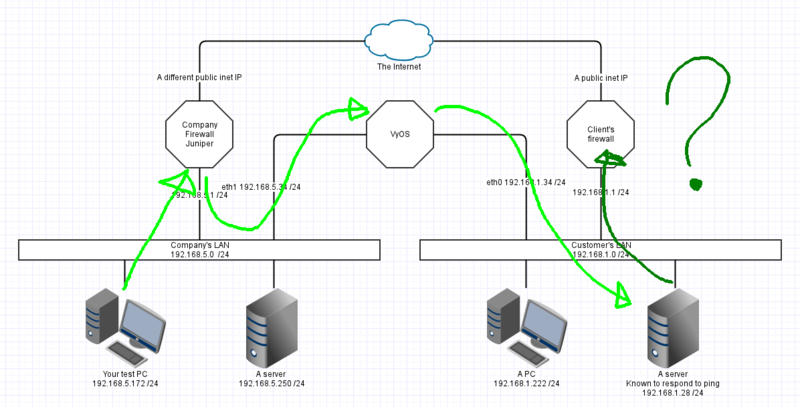 This is the "proper" design, using a small interconnect network between your two firewalls, and doing away with the VyOS device. I've used 172.22.22.x/24 as an interconnect LAN. A /24 is quite large, but keeping this simple. Each firewall knows about all traffic and can be connection-tracked properly. Each LAN device has the simplest setup possible. Both firewall devices will require an additional ethernet interface, and an ethernet cable run between them. It seems to be missing. 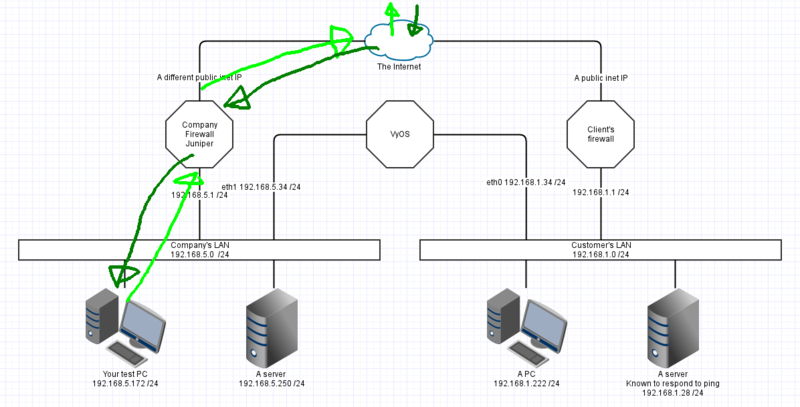 If you added the blue arrow from Customer Firewall to VyOS then it would work better. Someone famous once said "If your plan involves adding more layers of NAT then you don't understand the root problem" I don't really think this is a good idea. If the VyOS device NATs all traffic between the two networks to its OWN IP in that LAN then reply traffic will not attempt to go to the default gateway. Main downside is that you'll see all traffic coming from the VyOS IP, and you will have no idea who the real sender is. This makes forensics somewhat more difficult. 4. Static route all the things! This is a terrible answer, but in some situations it might be appropriate. 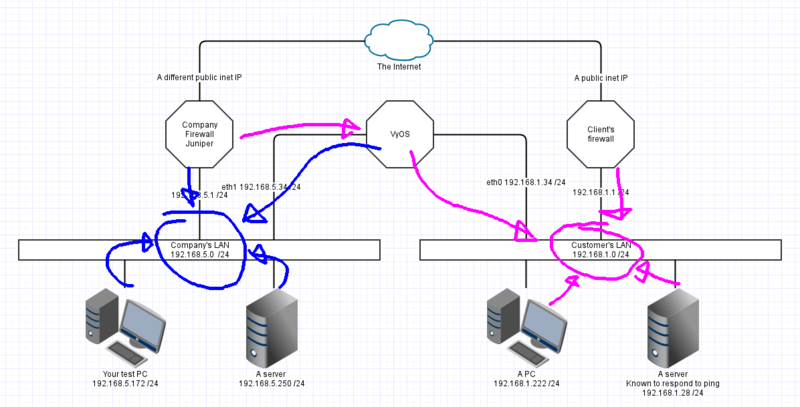 If every LAN device had a routing table like this, then they'd all know how to talk to the custy LAN. Downside, this is a management nightmare. It might be workable if you have only a couple devices that never move, but adding them dynamically is messy. Active Directory can push out static routes with Group Policy. Won't help any device that isn't a domain-joined windows box. Printers, phones, APs, everything else misses out. That's all I know about that. Its possible to push a static route with DHCP, but most implementations ignore the offer. pfSense can do it, but windows10 ignored the option. 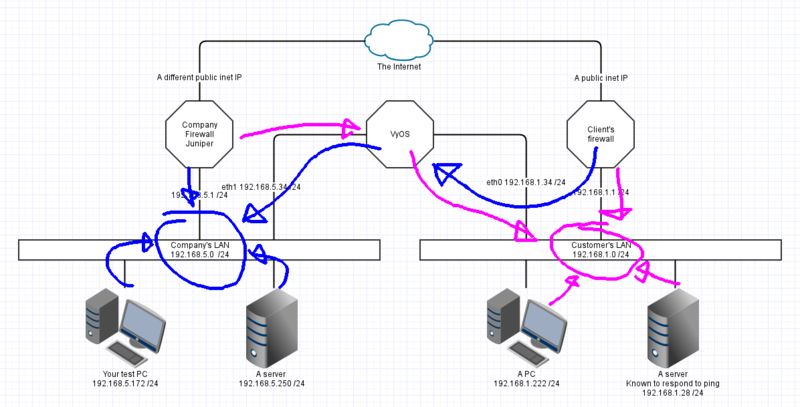 LAN Maps are awesome solutions for understanding your networking problem. Love them! I've used http://www.gliffy.com/ to create the background image for these illustrations. KISS If a solution is tedious and complex, its probably the wrong solution. Not the answer you're looking for? Browse other questions tagged tcp subnet juniper vyos or ask your own question.